Having a smartphone is often sensationalized as being like having an extra limb; we use it most of the time, and feel bereft without it. Sad, but entirely true. It figures then, that we would want to protect the device as much as possible. While smartphones and tablets have improved in quality – with more expensive and complex hardware within – the probability of them breaking during everyday occurrences, such as dropping from a certain height or immersing in water, has naturally increased. We’re starting to see signs, however, that in future, the high insurance costs incurred by a damaged device could be eradicated for good. Liquipel, for example, has created an invisible film that can be applied to electronic gadgets and offer a waterproofing solution, so when, for argument’s sake, someone decides to throw you into a swimming pool fully clothed, you can rest assured that your device is able to withstand it. Liquipel have been reportedly chatting to Apple and Samsung about applying it to devices in future, although nothing has yet been confirmed. That’s all well and good, but it doesn’t help with the other issue. Although the iPhone 4/4S casing is much tougher than those of its predecessors, it still cracks rather easily when dropped. Furthermore, since the glass is hardened, the chances of slicing the skin on your finger are increased, meaning you’re left with a device that not only looks like garbage, but is hazardous to health. It doesn’t just protect the device’s cosmetics either, since it acts as a shock absorber, soaking up the impact of an accidental drop. An annoying feature of other screen protectors are the air pockets underneath the layer, which seem impossible to iron out with the finger. 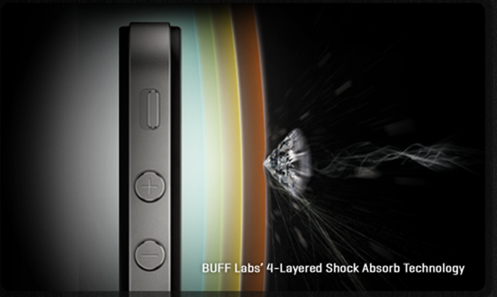 Since the BUFF protector is made from premium silicon adhesives, said bubbles apparently disperse within 24-48 hours. Additionally, it’s scratch and stretch proof, and has a non-slip grip, meaning the likelihood of you dropping it in the first place is much reduced. At this point, they don’t appear to be available on the BUFF website, although rumor has it that they are floating around the Web for $20-$30. If you know where these can be obtained, give us a shout on Facebook or Google+ because, well, we want one!